What started out like any other Friday chilli-and-games night would introduce Dark Blue Monkey and his best friend to a world that would shake the foundations of what they understood about gaming. The year was 1994. I’d somehow bluffed my way into a third year of uni in Edinburgh. I was still gaming, but I’d shifted fully over into the 32-bit world of the PC, my poor Atari ST languishing unloved under my bed. A lack of funds meant I wasn’t picking up PC Gamer or any of my other usual magazines anymore, so I was a little out of the loop, relying on my best friend Martin to keep me up to date. One day, in late November, I was trudging back home on a slushy dark evening to the flat after a long day of lab work, my heavy backpack weighing me down. It was a Friday night; the end of the week, and I was looking forward to a hot shower, a huge bowl of chilli and the chance to play some games. Better still, I’d made arrangements with Martin for him to come round. He had the latest edition of Edge magazine, and he’d hinted he was super excited for us to play a new game he’d just bought. It was about 8pm by the time he arrived. He’d parked on the sheltered side-street under the orange street lamp outside a shuttered convenience store and climbed the stairs up to my flat on the top floor, leaving wet footprints on the stone stairs, snow flaking from his shoulders. I was still making the chilli, so he dropped into a seat at the kitchen table and thumped down a plastic bag with a bulky looking box and clinking beer bottles, spraying droplets of melted snow on the horrid orange surface. He accepted a steaming bowl of the eye-wateringly spicy chilli made from some cans of dubious stewed steak. As we sat there, he indicated the bag with his fork, and its hidden game inside. “It’s like Ultima Underworld, but in space”, he explained. “You’ll like it.” He chewed some more and went on: “I only played the first bit, cos I had to head out to come here. It looks awesome!” I took the box out, setting it on the kitchen table. Emblazoned on it were the words System Shock. The images on the box electrified me. So, discarding formality, we took the chilli back to my room and grabbed a glass bottle of cider from the fridge on the way. The year is 2072, and you’ve been caught red-handed hacking into a corporate network. In a sudden change of fortune, you’ve been offered amnesty, a clean slate, and even a lucrative neural interface to make you an even better hacker, if you help out one of the corporate bosses with a little private task: to remove the ethical constraints from an AI called SHODAN, in order to let it hypothesise unethical solutions to the world’s problems. What could possibly go wrong? SHODAN, it appears, is the AI that controls a space station – Citadel Station, to be exact, which orbits Saturn, mining the gas giant using a tachyon laser. In order to perform your little task, you need local access and luckily, since you’re going to the station, it happens to have some private medical facilities for you to receive your secret reward away from the prying eyes of the law, or other parts of TriOptimum – the company responsible for SHODAN, the Citadel Station, and much more. SHODAN, it quickly became apparent, is irrevocably corrupted by your meddling, and comes to some conclusions that even your benefactor comes to regret. After the intro, our character ‘awoke’ in the neurobiology suite, six months after these events, sporting a military grade neural interface (to explain the HUD graphics). 3D RPG games had been around for a few years, so we were familiar with the general layout from previous games (such as Underworld), but this was on a whole different level. The thing that really caught our attention was that the screen was far more advanced than anything we’d seen before. 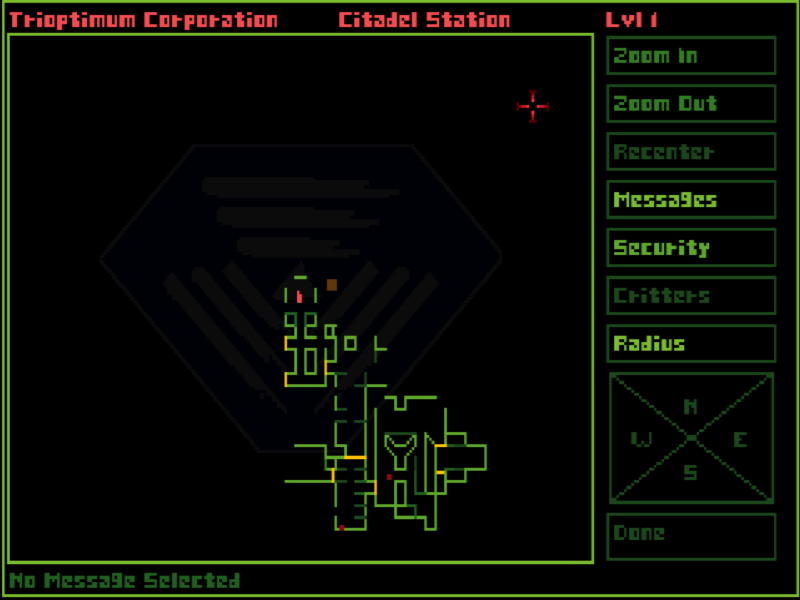 In previous games, the 3D “window” had been small to keep the load on the graphics card down, and the pre-drawn ‘frame’ that acted as a border around the 3D window was largely a static image in the game’s style, onto which it would place the text and icons to display your inventory, spells, weapons, etc. 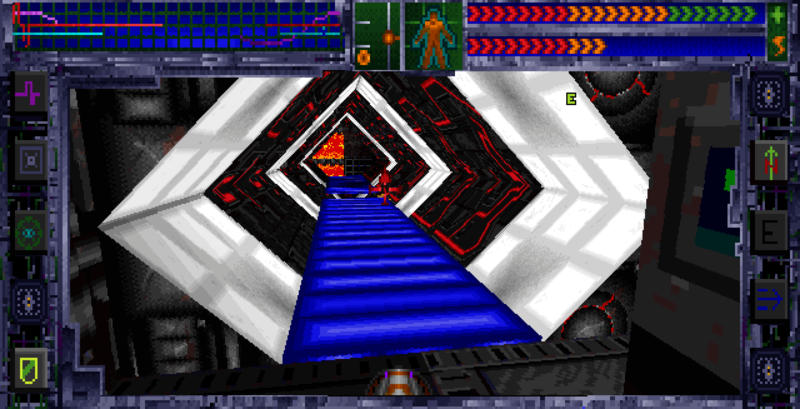 However, in System Shock, the window was far larger and there was even an option to make the static frame vanish completely, allowing the world to take up the whole screen. Also, instead of static images, the bottom part of the screen was taken up with three multi-purpose ‘screens’ (multi-function displays or MFDs). Each of the three displays could be toggled between maps, inventory, messages, logs and more, reminiscent of the MFDs of an F-16 fighter jet. When the frame was made transparent, the MFDs became transparent too, and you could even interact with the world “through” them by clicking on objects on the floor, yet still drag items off the floor and onto the transparent ‘panels’. The actions of clicking, dragging, and manipulating MFDs was perfectly implemented, making them fluid, natural and joyously cyberpunk. Looking Glass had crafted a wonderful UI with a futuristic feel. For instance, your health and energy status was displayed by a heartbeat and oscillating ‘biorhythm graphs’ as well as bar-graph. You could also crouch, lean, and go prone, as well as look up and down, showing off the true 3D engine, where most games prior had been 2.5D. We spent ages exploring the wondrously interactive UI, and playing through the first area that Martin had explored at home. The area itself was ‘sealed’ as a training room to give you time to get used to the controls. Exit into the main game was through a code-locked door, requiring a little exploration to find the code, requiring a little combat and some searching. As we neared the closed door of the neurobiology suite, we had traced some very faint ‘snuffling’ sounds coming from some distance beyond the locked door. We had the sound cranked way up to listen to the wonderful music, but keep abreast of any faint noises. As we considered the door’s keypad, the speakers suddenly exploded, emitting a horrifically loud HUMMMM-THUNK. There was something huge RIGHT THERE in the room! I nearly fell of my chair, and Martin spilled beer all over his arm. In a blind panic I regained control and we ran back to the starting room, cowering with our lead pipe raised, awaiting whatever ED-209 or another horrific robot had made the noise to blast us into atoms. After a minute, and a significant lack of any kind of electric death, we sheepishly dialled the sound down, and cleaned up the spillage. We made our way back to the exit of the neuro suite, looking for the door access code. Checking our logs and emails in the game, we found the code and typed it in on the pad, and the moment the door opened, a *thing* lurched through, roaring and swiping at our face! Backpedalling, acting on pure adrenaline, we whacked the lead pipe over and over at the blur of flesh and claws, making a sickening wet thumping sound as the metal connected with deformed creature. It kept coming, ripping and roaring, pushing us back into the suite. The scene was like something out of a horror movie, screen flashing red, and vitals dropping with each clawed swipe! The final rasping roar it gave out as it collapsed spoke of pain, and the thunk as its lifeless body hit the deck was lost in the pounding of our hearts. After some Dutch courage, and me wiping the sweat off my palms on my jeans, we snuck through door into the main deck and were met by a pre-recorded, and completely normal greeting. It was SHODAN welcoming us back from our medically induced coma! We just stopped and stared at each other; the crew log we’d picked up earlier painted a desperate situation of growing unrest, weird happenings and glitches, and yet here was a totally normal message as if the mutant attack had never happened. What the hell was going on? Was this place in turmoil, or not? 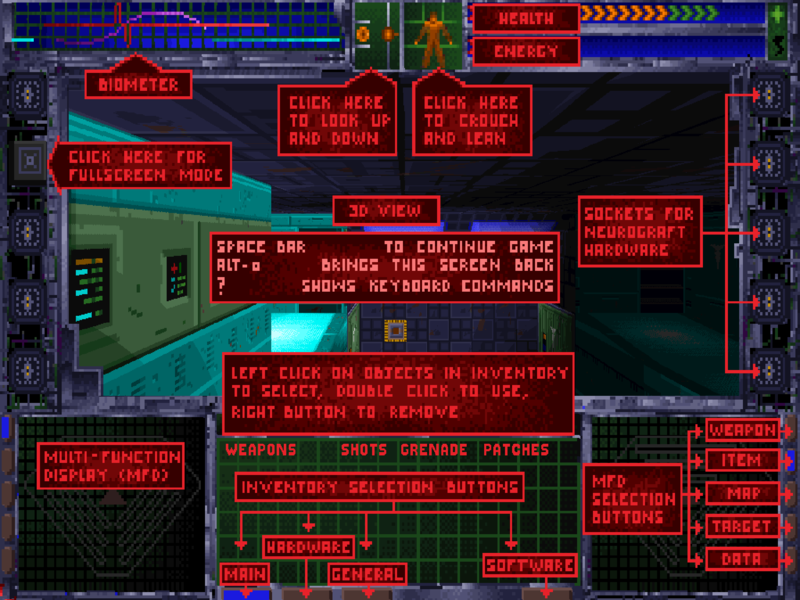 As we were to discover, one of the wonderful things about System Shock was that logs were picked up in whatever order they were found, even if out of chronological order. Like a Quentin Tarantino movie, it was up to us to piece together the station’s gradual slide into devastation and corruption. But once in a while, we’d pick up a normal log from when the station was fine, or we’d come across an area that looked totally normal, and the incongruity of it added much to the pathos: here was a beautiful station filled with hard working people we came to know, all suffering a horrible experience by our actions. The first level was brilliantly laid out. It had side-passages and hidden lifts that emerged behind a grill. You could see dead bodies, blood smeared on the walls, and just-out-of-reach power-ups. It had maintenance areas that went nowhere, but they were dingy, and filled with pipes, giving the feel of a real space station. All the while you could hear the growling, stomping and angry moans of the monsters that patrolled the decks. We crept on through the dark and broken station, expanding the minimap (a revolution in its time). Pretty soon, the station’s AI started to notice, and was taunting us. That taunt has long since become a meme. By 3am, the only light on in the flat was my desk lamp, the two of us hunched over the desk, still engrossed in System Shock. Outside, the traffic had thinned. Only the gritting lorries, taxis and snowploughs were out, sloshing their way through the slumbering city. We’d finished the chilli and drinks hours before, and had finally made it through the terrors of the first level to a resurrection station, which meant we could now freely die on that level but be brought back to life. It felt like a good place to stop, and the hour had long ceased being antisocial – it was verging on illegal – but while we considered turning in for the night, neither of us wanted to stop playing. The game had us gripped, so we refilled our mugs, pulled on some jumpers and coats (as it was damn cold in my room), and sat back down in front of the PC. While the fear of dying wasn’t as scary a prospect due to the resurrection station, the ‘death screen’ itself was nerve-wracking. It portrayed your body being lifted by the head, sucked up into the underbelly of some mechanical spider, before sharp things jabbed into your skull while your eyes rolled back into your head and your limp body dangled beneath. We laughed so hard. The comedy music of the elevator felt like someone had uncorked a bottle of champagne. All the stress just exploded out of us, and we were in stitches laughing at the ridiculousness of it. By about 6am, we were utterly exhausted. We’d solved puzzles, crawled dark passages, and battled security robots, flying creatures, dead crewmembers and all manner of weird hopping, creeping things. Despite this, we were still only one-third of the way through the game. Finally, creeping around the partially-invisible mutants in the eerie darkness of the third “Maintenance” level, coupled with lack of sleep, had proven too much for us. Martin staggered through into the lounge, flopping onto the sofa, having borrowed one of the flat’s spare blankets, and switched on the bar-fire to avoid freezing to death. I don’t remember falling asleep, but I woke up six hours later fully clothed on top of the covers and freezing. I made a giant breakfast and waved a huge pot of coffee under Martin’s nose. Neither of us could stop talking about System Shock through chattering teeth. 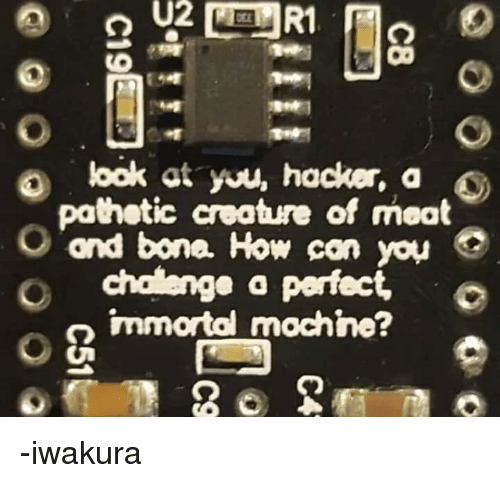 How could we defeat SHODAN? We’d found a phenomenally powerful gun, but a cryptic message in the game’s readme file told us not to use it! There were places in the game’s “cyberspace” we couldn’t seem to get to – a secret passage somewhere? 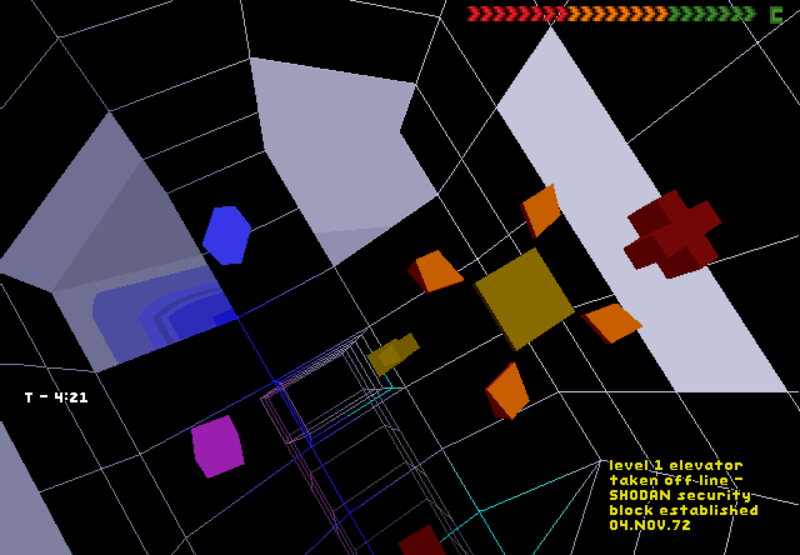 We’d also noticed that the mesh ‘walls’ of the cyberspace simulated the Game of Life AI simulation when you shot them, which was making us chuckle about how cool the developers were, and whether we had to make a certain pattern to get to the inaccessible bits of the cyberspace. We sat, gripping our coffees and just talked about the game for an hour. After breakfast, we headed back into my room, and booted up the PC again. The snowfall had stopped outside; life was returning to the city. My flatmates had gone out, leaving just the two of us at home. Cracking our knuckles, and trying to keep warm in the cold room, we set about defeating the inviso-mutants of level 3. By lunchtime, we’d made our way up to level 5. I ordered a pizza to be delivered. This was such a regular occurrence that the pizza place in nearby Causewayside knew our number and I just had to say “the usual” and 20 minutes later, an “Inferno pizza with extra chillis, peppers and pepper flakes” would arrive. I like hot pizzas. However, by 6pm Martin had to head home. He needed a change of clothes, and didn’t fancy sleeping on the couch for another frigid night. Hating to be torn away from the game, we said farewell, and he vanished down to clear the snow from his car and drive home in the darkness, as the snow started to fall again. It took us another two days, spread over two weekends, to finally finish the game in its entirety just before I headed home for the Christmas holidays. Once it was over, both of us agreed it was the best thing we’d ever played, and we’ve constantly talked about it ever since. We showed it off to our friends, and loads of them got into it as well. We shared notes, discussed what it all meant, and theorised over late-night coffees about how powerful a tachyon laser would need to be to “wipe out all life” on Earth, from Saturn’s orbit – a key plot point in the game. 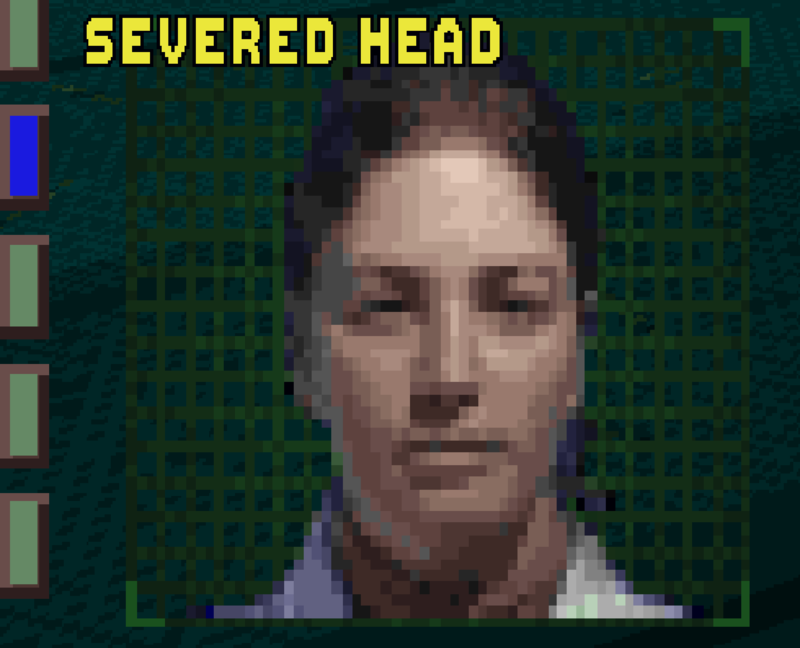 To say System Shock was epoch-making may be a bit of an overstatement. However, it was definitely a major milestone in gaming history. In my opinion, such a powerful story had never been told with such style, and didn’t have such a brilliant set-up so flawlessly executed. It was dark, it was atmospheric, and it was brilliant. It wasn’t a surprise that Looking Glass Technologies had been the architects of both Ultima Underworld and System Shock. Both games had a style to them that few other studios could match. Everything was just right, from the graphics to the music. In fact, the game created ripples in the gaming collective consciousness that are still being felt 23 years later. The gun that we’d been told not to use turned out to be the Magpulse, the most powerful weapon against robots in the game. It was basically a ‘get out of jail free’ card, delivering a one-shot death. Bullets were very restricted, but it allowed you to get through an area if you simply couldn’t do it another way. I don’t know of any other games which copied this, but it was a brilliant move, as it sat in your inventory begging to be used, but you never knew if you needed that bullet later or not. Using it was both a relief and a worry! The weapons all had several kinds of ammo, while the energy weapons had different ‘power’ levels, which was innovative. Melee weapons never stopped being effective, either, and definitely set the game apart from contemporaries that tended to keep you permanently stocked with ammo. The famous “look at you, hacker…” quote has gone into common parlance, and even people who haven’t played the game recognise the quote. The same can also be said of the game’s final message to you when you quit: “keep the fries salted”. That enigmatic statement raised eyebrows, created smiles, and we still use it as a “bye, then!” to this day. The music was perfect throughout the whole game: a mixture of sci-fi optimism, with a curious “exploratory” tone to it. It used a clever ‘layered MIDI’ system, morphing gradually to match whatever the player was doing – fighting, exploring and so on. It painted a lovely rich texture through its adaptability. 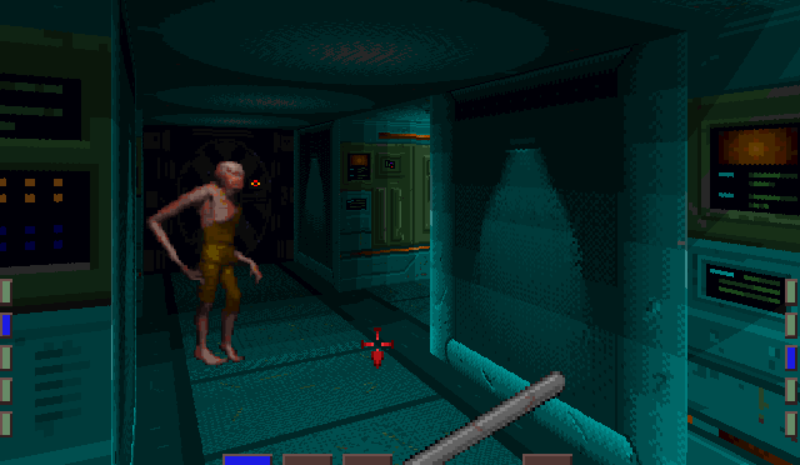 System Shock went on to spawn a very well-regarded sequel, while the original earned itself a remake at the hands of Night Dive Studios, due for release this year. 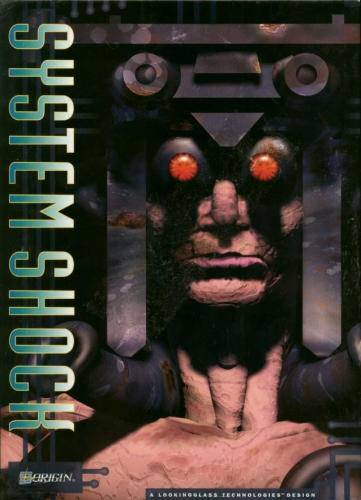 There’s even a System Shock 3 in production at Otherside Studios under the guidance of Warren Spector, one of the original designers of System Shock. 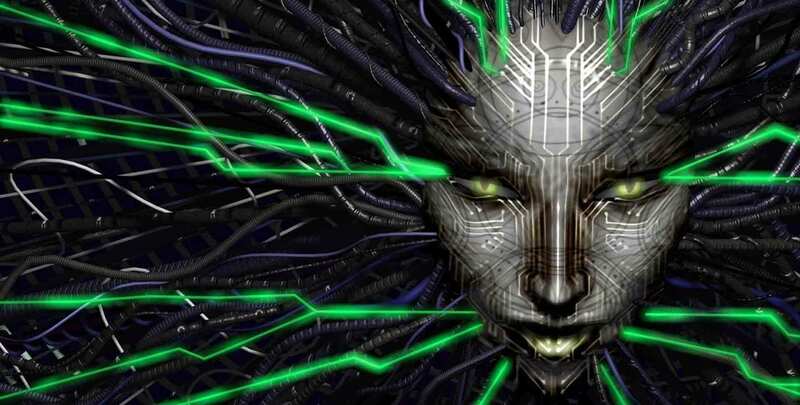 It wasn’t long before an avid community was begging one of the two studios to remake System Shock 2 at some point as well, bringing the whole series into the 21st century. 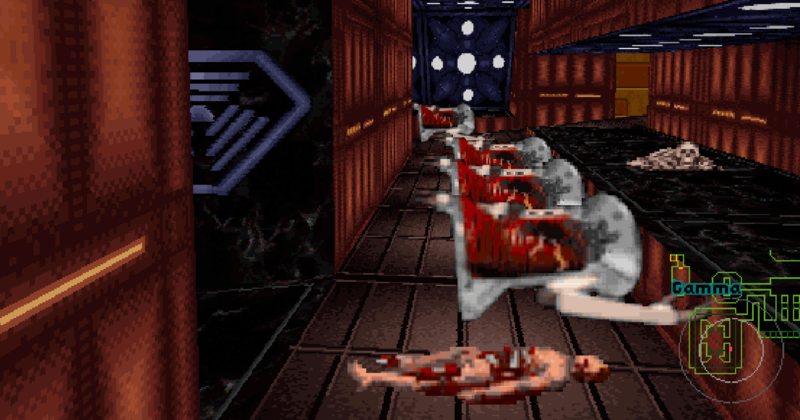 When it comes to macabre space horror, with deep RPG cyberpunk themes and an enemy worthy of your attention, few games match up to the perfect package of System Shock. Although the original is old, the enhanced version is mouse-friendly and packaged neatly on Steam and GOG by Nightdive. It’s often up for sale too, so you have to pick it up. Soon, however, the remake will be with us and then, once again, I hope to sit with Martin and relive one of the best weekends of our lives. I might even make my (in)famous chilli again. At the time, System Shock was hugely underrated. Since its release, it’s gained a cult following for good reason: its intelligence, style and great execution. 3D games are now very sophisticated, but while it can seem a little dated, its remake prospects are made all the sweeter due to its ideas. What’s more, the enhanced re-release is still very playable 24 years later!